Performance Time: Approximately 90-120 minutes, 79 pgs. MUSICAL. 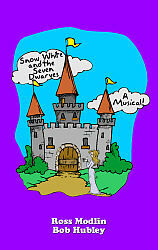 This hilarious musical will entertain audiences of all ages with its adorable characters and original songs. Snow White’s stepmother has put a spell on the King and has moved her two sisters, Hoighty-Toighty and Fru-Fru, into the castle. Determined to be the fairest in the land, the Queen sends her sisters and a huntsman to lure Snow White into the woods and kill her. When Hoighty-Toighty and Fru-Fru start bickering, Snow White escapes and soon encounters seven silly dwarves, who work as organic gardeners. The Dwarves invite Snow White to stay with them (even though she likes to talk a bit too much), but it isn’t long before the Queen sends her sisters to do her evil bidding once again. This time, their evil plot is foiled when a turtle “rushes” to the organic garden and informs the Dwarves, who revive Snow White just in time. Realizing that her sisters are totally incompetent, the Queen takes the matter into her own hands and sets out to rid herself of Snow White once and for all!